but how many of us understand exactly what that concept really means? If you are an ambitious woman, it is vital for you to understand how loyalty is related to success. Without loyalty—our loyalty to others and their loyalty to us—we cannot truly feel complete, and our victories will be very hollow indeed! Colin Powell said, “Success is the result of perfection, hard work, learning from failure, loyalty and persistence.” I have every reason to believe this is the truth. In my own life, I have found over and over again that loyalty is one of the key factors that separates the truly successful from those who are unsuccessful or have only the appearance of success. Let me put it another way. In the Bible, Jesus said, in Mark 8:36, “What shall it profit a man, if he shall gain the whole world, and lose his own soul?” Think about this for a minute. We all know of people who are financially successful but live miserable, defeated, lonely lives all the same. Does this describe you? Are you successful only on the surface? The reason could be a lack of loyalty. Everyone needs someone to be loyal to them but they also need to be loyal themselves. Demanding unquestioning loyalty from someone who cannot expect the same from you never works. Instead, you must live with consistency and loyalty in all your actions in order to inspire loyalty in others. This may also mean cutting people out of your life who have proven they are disloyal. If you have been faithful and they are disloyal to you, get rid of them. You do not need people like that dragging you down. Instead, choose friends, colleagues and co-workers who are loyal and who will support you in your efforts to find success. 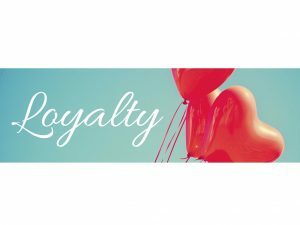 Creating loyalty may be hard work but the rewards are tremendous. When you surround yourself with people to whom you are loyal and give loyalty in return, you can relax knowing that even if you stumble, someone will be there to pick you up, and that you can pick others up in return!